We just sent out our October needlepoint newsletter. 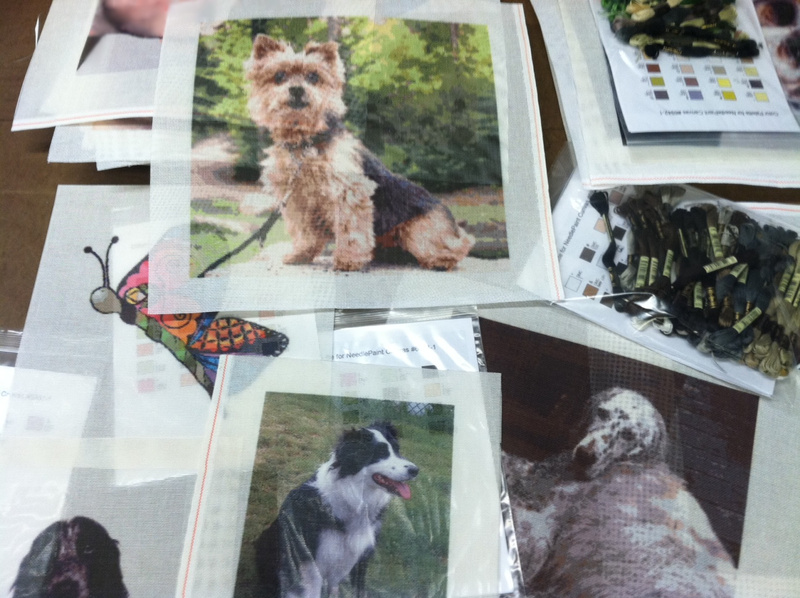 A lot of fun custom needlepoint projects! Please note, if you would like to subscribe to our newsletter, you can email us with your name and email address, and we will add your name to the list. Or click here, and select the Subscribe option. If you would like to view the live version of the newsletter with links that actually work, click here. 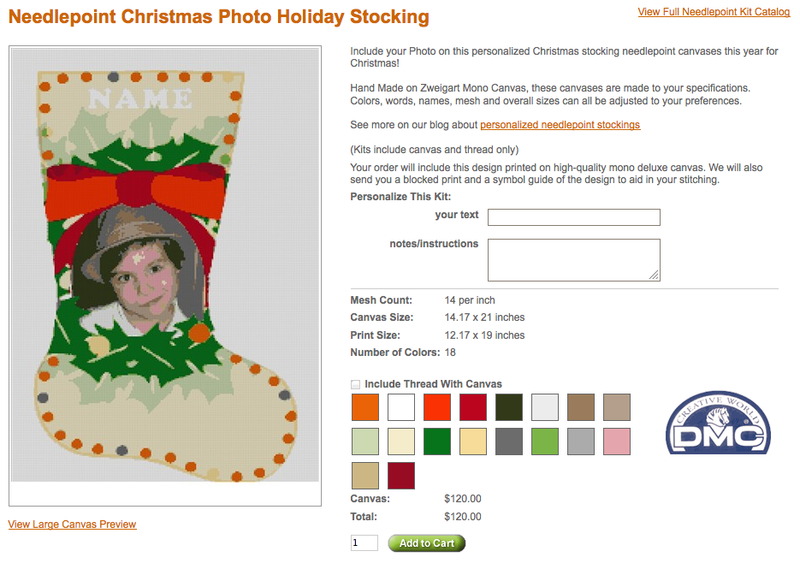 You can now stitch a great photo needlepoint stocking very easily. As part of our new personalized needlepoint shop, we added some stocking designs that have an area where your favorite photo can be added. To view personalized needlepoint christmas stocking designs that you can add your photo to, just go to our personalized needlepoint shop. All you have to do is type in your name and place the order and then email us the photo you would like to include. We will email you back a preview of your design for your approval. We won’t ship any personalized orders until we have approval, and all orders are 100% satisfaction guaranteed. See our post on customer satisfaction to learn more! The last few months have been going very well at NeedlePaint.com. As you may guess, creating custom needlepoint kits is not always a perfect process, but we always do our best to get it right the first time. A few things you may not be aware of that we do. #1. We love to help before you place your order! If the photo needlepoint preview does not look as good as your want or you want help cropping it, please email us the photo and we will work on it and help you with your project. Also, we develop designs from scratch and are happy to discuss ideas for a new project. #2. We review your order to be sure there are no major errors and that it looks like something we would want to stitch. You will get an email asking for the photo if we think colors may not look right, or that the canvas needs to be improved. #3. Sometimes colors on the computer look good, but when we proceed with the order, the colors we find are totally off! 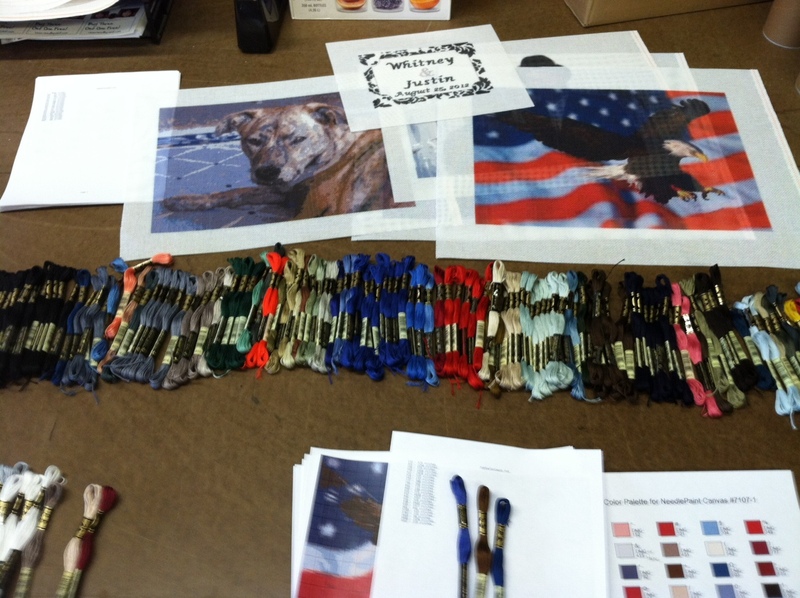 On animals and people we try to color match the floss by hand as computers don’t recognize dog breeds or skin tones. Most often, we’ll get purple and green tones, but alas, we will fix them! #4. If you are not happy with your project, we will fix the design and replace the canvas! These projects take a lot of time and the needlepoint will probably be with your family for a very long time, sometimes generations, so we encourage all of our customers to speak up if they have any problems with an order. The feedback we’ve been getting is really nice, and lets us know that going the extra mile is worth it!